There has been enormous interest regarding the Samizdata.net article last Wedneday about the bizarre poster appearing across London. The large number of comments and e-mails that people have left present a wide range of fascinating views and a few rather odd theories. This is a spoof, a cultural hack! No one in authority could be so daft as to use such obvious 1984’ish imagery. No, it is entirely true. As mentioned by Brian Micklethwait in the previous Samizdata.net article, here is the appropriate link to the London Transport website. Whoa! There is a UFO up in the corner! This is creeping me out! Relax! I went out and looked at the poster again and it is just a reflection of a lighting fixture from the bus shelter… the imagery is sinister enough without any UFO references! What is wrong with trying to make buses safer? Nothing at all. However the point I was making is the 1940’s imagery and choice of words in the poster suggests far more than keeping Granny safe on the bus. 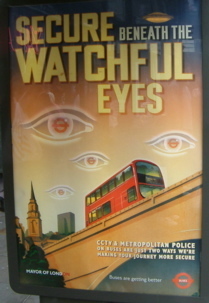 It is a propaganda poster in the most literal 1940’s sense of the word, and what it is advocating is ‘Safety through Panopticon‘ : nothing less than a surveillance state. Totally Cool! What great graphics! I want one! Yes, I agree. Although I may be an arch-capitalists libertarian individual rights advocate who hates the message and sub-text these posters convey, I also have a nifty Communist Chinese poster on my wall and would love to add one of these babies next to it. However they are enormous and I do not think they are available for sale yet. I did not read the article until yesterday and saw the vast flood of responses this article triggered. Not surprising. This is where we are headed in Britain. The pretence of even going through the motions on civil liberties in Britain has now been totally abandoned. It is the sheer shamelessness of this poster, with its 1940s imagery, which strikes home. I can understand why some might have thought this was a spoof, but clearly it isn’t. Makes you wonder how the editors at satirical publications like Private Eye or the Onion can make a mark when this happens for real? It is also shocking that this poster has not been more widely mocked in the media. Don’t waste your breath for the Guardian or other so-called progressive Big Media to cause a stink. Come on look you don’t get the ad agency culture in the uk. This poster was dreamt up by a saatchi type with red braces and pink socks not by some government type in room 101. It’s meant to be sylishly ironic like a lot of UK commercials. The UFO is some agency types idea of a scene setting pictogram. It’s MEANT to be a reference to conspiracy motifs and would have been approved by a mayoral administration who consider themeselves funky young and in touch. 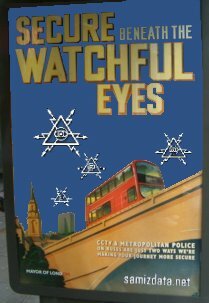 London Transport wanted to resonate with the young who would relate to the conspiracy and ufo image and the elderly who would relate to the 40’s type of design. Maybe you should get out more…hey take the bus. si(mon): Er, the ‘UFO’ is not there, it is a reflection of a light fixture. Don’t you actually read the bloody articles before commenting? But you are right that the ad agency is ‘in touch’ with the reality of Britain today. We have more CCTV cameras per capita than any other nation on Earth. So why is crime still going up if that is what they are for? Forgive me but I think anyone who gets tight about this must have had an irony bypass. The poster may be arseaholic but it doesn’t threaten me at all. Big bother not big brother. I wish you’d get as upset about upcoming tax increases. i gagged on my coffee when i went to the london transport website. that blinking eye is sooo creepy/cool!! i didn’t see a gift shop link on the site – too bad, they could clean up with merchandising this graphic. If you want real creepy try this…. the same Ken Livingston Mayor of Londinium is going to ‘charge’ five quid to drive into the city. For six months prior to the ‘charge’ traffic lights have been recalibrated so as to enhance er..congestion. Also announced: if you dont pay the five royal pounds for three trips your car will be impounded by Kenneth and subject to sale. So the ‘charge’ is really a fine. It’s a penalty for being a dirty polluting little capitalist or to you and me a delivering florist or sandwich business. So Ken controls the offence (the congestion), he controls the penalty (five nicker or more or more) and his mayoriness dictateth the punishment (your Vauxhall Astra in the pound). Now that’s scary. Our mayor, Nurse Bloomberg (i live in NYC), is thinking about establishing a toll for east river bridges (Brooklyn, Manhattan, Williamsburg and Queensboro). He hasn’t done it yet as there are legal/political roadblocks to consider, but yeah, this is the right time to make it harder for people to get into Manhattan! Must be something in the water! What an incredible image! Someone, somewhere is laughing all the way to the bank, as he counts his money from London Transport for desiging that thing. I’m sure you folks are busy with more pressing matters, but is there any chance you could get a better image of the poster, sans reflections if at all possible, and/or close up images of the text on the bottom half of the poster. That would be greatly appreciated. If The Village had a bus system, this would have been the poster for it. The UFO may be a light fitting but the eyes themselves are totally reminiscent of B-movie poster flying saucers. You could change the caption to “Invasion of the Eyes from Outer Space!! !” and it wouldn’t look out of place. Remember the 1970’s TV series ‘1990’?? I agree Chris above. I think that the poster may be something of a joke on the part of the person and/or agency who designed it. It’s a joke at the expense of the people who commissioned it, though, and I am sure the designers would not admit this. There is no doubt that the Metropolitan Police, Ken Livingstone, and London Transport all mean it seriously. The blasted thing is up all over London. For some reason, I think it would look great on my wall next to this poster of the Powerpuff Girls. In Texas we have a law that requires the local sherriff to issue a permit for a concealed handgun once one has passed the safety class and submitted ones fingerprints. I personally don’t care for the fingerprint part of it, but the rest is ok. US law Title 10, section 311 states that all between 18 and 45 are members of the militia. The import of this law is that the militia may arm themselves, (with regulation by the state and local goverments). Nothing like the security of a slight bulge in your shirt.